Earlier, the staircase was just a utility feature in a house, but now it is gaining importance as a central, focal point in interiors. You can opt for Curved, cantilevered, spiral or suspended, in steel, glass, timber, copper or aluminum – infinite possibilities have been opened up by clever design and engineering. You can read more about the different types of staircases here. 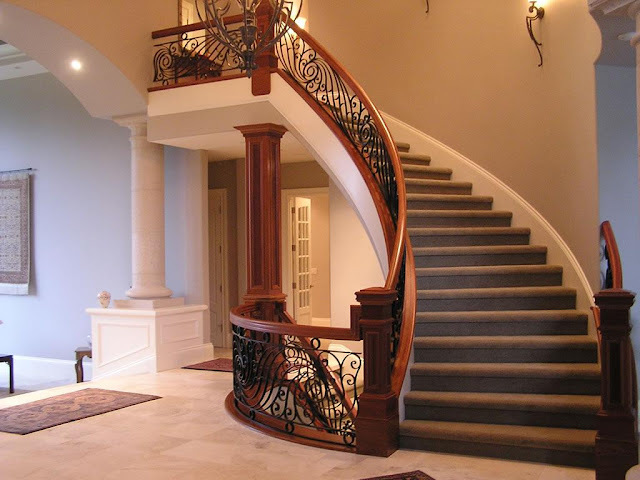 Some of the different shapes of staircases are Straight, Stairs with landings, Curved, Arched, Spiral, Circular. When choosing the shape of the staircase, the following aspects should be taken into account: Space available, Intensity of usage, Form (Shape) preferred, Convenience and safety. Since the staircase is used all the time to access other floors, the following points must be taken into consideration in the design of the staircase, to ensure a comfortable climb. Split staircases: It is always preferable to have a ‘Split staircase’ also known as a ‘staircase with a landing’ as it forces the climber to rest, pause for a few seconds, thus making the climb more comfortable. 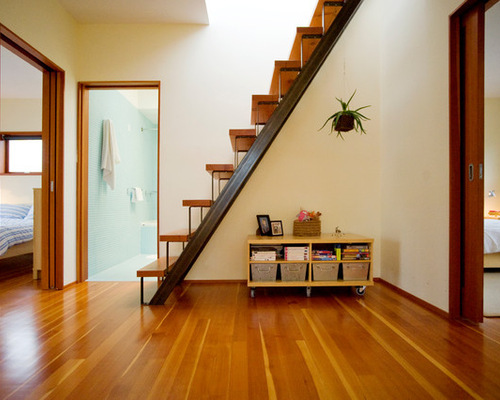 A split stairway also uses up minimal floor space. There are many different types of staircases-with-landings such as the Straight staircase with landing, L-shaped, double L-shaped and U-shaped staircases.You can read about it in my post Stairs with landings. 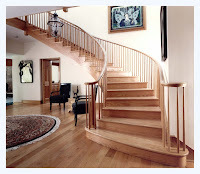 Staircase width: The width of each flight of the staircase should be 3' or 3'6". If space restricts, then you can compromise with a 2'6" wide flight. Tread-To-Riser ratio: Usually stairs have 10" or 11" treads (the horizontal step on which you place your feet) and 6" or 7" risers (the vertical height between treads). It is important to make sure the total of the tread and riser should add up to 17 inches. This means that as the tread gets shorter, the riser should get steeper for the stair to feel comfortable as you climb. There are limits, of course. A riser of more than 8¼ inches is going to be too steep for many people. Consistent treads and risers: If you stumble or trip on a staircase, it is probably due to an odd tread or riser that is not the same size as the others. Our bodies get into a rhythm when climbing or descending, and even half an inch of difference can throw us off. So while planning a staircase, keep in mind the extra thickness of the flooring (that will be added later), while calculating the riser and tread dimensions. Tread overhang: A tread overhang will keep heels from scuffing risers on the way down and help you find your footing on the way up. Space between treads: Sometimes, the riser is omitted entirely – it’s just empty space instead of a board. In such a stair, the stringer – supporting structure of the stair is visible. For safety, a stair that doesn’t have a riser should have a thicker tread and lesser space between treads. Ceiling Height: On the way up, people will bump their heads if the ceiling is too low. On the way down, it’s hard to judge ceiling height, so people will duck if it looks too close. To prevent this, as much ceiling height as possible should be given. The distance from the highest tread below a ceiling should be at least 80 inches, or 6 feet 8 inches. 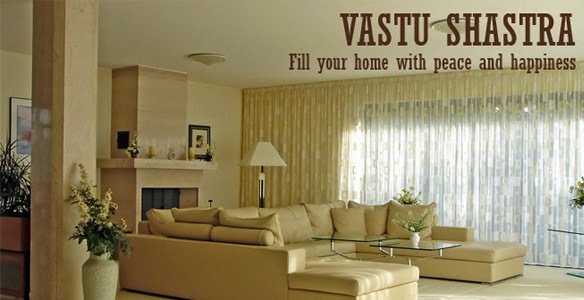 Lighting: While planning the staircase, it is worthwhile to think of the lighting points, even though the lighting design for the house is given later, at the time of casting the roof slab. The lighting should be planned in such a way that the stair flights are visible. If you want lights along the length of the stairs then it should be embedded along with the stairs during its construction. Staircase drawings: The Contractor has to follow the staircase drawing given by the architect along with the structural staircase details prepared by the structural designer. 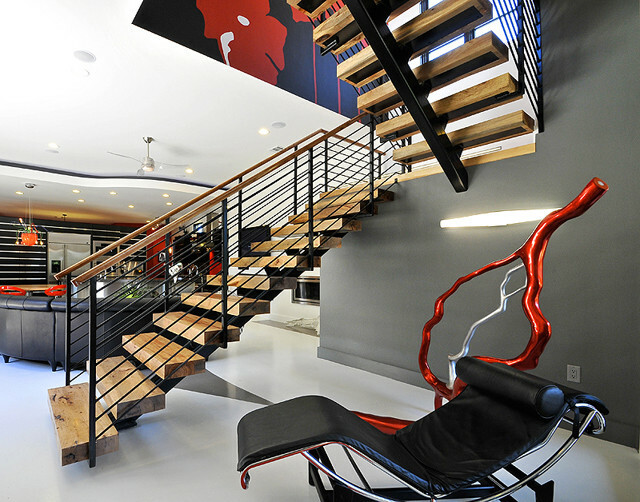 The construction of the staircase depends on the design and materials used. Slight slope of tread: The treads should very slightly slope towards the front for comfort in climbing and to make sure that the rainwater in open staircases does not stagnate and will flow out. Grooves in treads: It is advisable to have 2 or 3 groove marks along the length of the tread towards the outer edge, to give proper grip to the climber. Grooves can be cut in the flooring material used to cover the steps - whether it is Kadappa or Granite.